If Charley Pride‘s life had gone the way he planned, you would be admiring him for something else other than singing. But much to his dismay, he was forced to put his original career plans on hold, and turned to his singing talent to support himself. We’d say that his backup plan worked pretty well. Today, Pride is known as one of country music’s most iconic artists. He has amassed 52 Top Ten hits over the course of his career, with a whopping 40 of those hits being chart-toppers. Known for songs such as “Kiss an Angel Good Mornin’,” “Is Anybody Goin’ to San Antone,” and “All I Have To Offer You (Is Me),” Pride had one of the leading voices in country music throughout the 1960s-1980s. However, the man known as one of the greatest artists in all of country music history once dreamed of being one of the greatest baseball players in history. He stood a good chance of achieving that dream, but sadly had it yanked away from him. Born into a family of 11 children, Pride had plenty of brothers and sisters to look up to while he was a child. His love for baseball may have been inspired by his brother Mack, who had a baseball career of his own before becoming involved in the ministry. Pride followed in his big brother’s footsteps and kicked off a baseball career as well. Baseball was segregated at the time, so Pride pitched for the Memphis Red Sox’s all-black team in 1952. That pitching stint got him exposed to a larger audience, and he signed a contract with the Class C farm team the Boise Yankees in 1953. Sadly, the year that Pride’s baseball career took off was the same year that it started its end. While playing for the Boise Yankees during his first year, he suffered an injury that severely affected his pitching. A number of trades followed in the young baseball star’s career. He was first traded to the Yankees’ Class D Team, then played for the Louisville Clippers before he and fellow player Jesse Mitchell were traded to the Birmingham Black Barons. 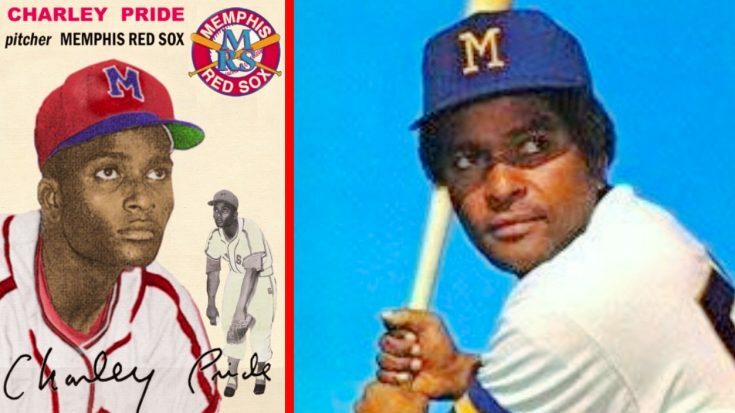 As Pride wrote in his autobiography, Pride: The Charley Pride Story, he and Mitchell were traded so that their former team could get a new bus. “Jesse and I may have the distinction of being the only players in history to be traded for a used motor vehicle,” Pride remarked. Pride kept pitching for other minor league teams, but had to put his baseball career on hold when he was called to serve in the Army. He put in two years of service before returning to baseball, though his injury still kept him from excelling like he wanted. He played three games for the Missoula Timberjacks, who eventually dropped him. Two tryouts for other teams ended in disappointment, as he was not picked up by either one. After making a move to Montana, Pride was recruited for the East Helena Smelterites, a semi-pro team in the area. While Pride was pitching for the team, the manager picked up on his singing talents. He offered to pay him an additional $10 if he sang for 15 minutes before their games. That marked the start of Pride’s singing career. American Masters documentary on the great Charley Pride debuted tonight on PBS. If it hasn't started yet on your local PBS, watch it. It's terrific. He's an American treasure. One of the greatest country singers of all time. Love him. And he was a helluva baseball player. Eventually Pride realized that his baseball dreams weren’t going to come true, and chose to pursue his singing instead. As we now know, the choice paid off. Although Pride had to retire from playing baseball, he never surrendered his love of the sport. In 2010, he became a special investor and minority owner of the Texas Rangers Major League Baseball club. Now that’s impressive! While Pride’s baseball career unfortunately never panned out the way he planned, we’re grateful things went the way they did. Otherwise, we may have never had the chance to hear his silky smooth voice, and would have never known some of country music’s iconic songs. You know the saying, when one door closes, another opens. And the door that opened for Pride led him straight into country music history.